No matter how many buckles you’ve won or how many you plan to, this series is targeted at those who barrel race for a living and those who do it as a hobby. Together, Clinton and Sherry give you the tools necessary to improve your horsemanship skills because no matter how experienced you are, there’s always room to improve and seconds to shave off your best time. The digital Barrel Racing Success video series may be accessed on your mobile device using the Downunder Horsemanship app, which is a free download from the App Store and Google Play, and on your computer through the Downunder Horsemanship website. This series will help you find and select an unbeatable barrel racing prospect; explain what equipment you can’t do without; demonstrate in-depth exercises to improve your horse’s foundation and your technique; and correct problems with noticeable results in a matter of days. Sherry shares her world-champion how-to strategies and will teach you to evaluate your runs and assess your horse’s performance. Clinton’s groundwork and riding methods are guaranteed to knock seconds off your time. His problem-solving techniques will help you troubleshoot common issues starting right in the alley. The in-depth series features Clinton and Sherry working with three barrel racing horses that are lacking the skills necessary to perform at their best. You’ll get to see the good, the bad and the ugly as they break down each horse’s problems and build their foundations. 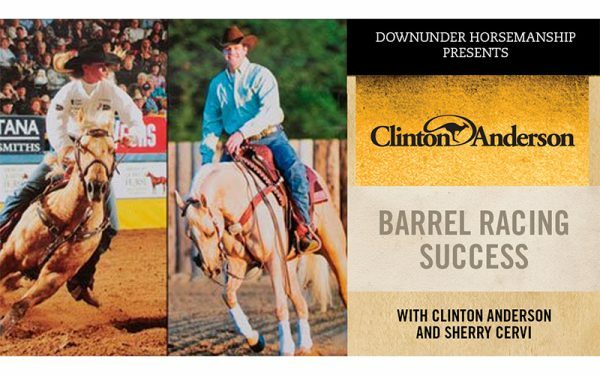 Throughout the series, both Clinton and Sherry work their own advanced horses to demonstrate the result of a well-laid out training program. To better detail her training program, Sherry demonstrates on several of her barrel horses ranging from a young prospect just learning the pattern to an advanced horse gunning for the National Finals Rodeo. You’ll watch transfixed as Clinton demonstrates the softness and suppleness he can achieve through all five body parts and be amazed at the speed and control Sherry demands from her horses.